A Las Vegas, Nevada based photographer's view of the people, nature and landscapes of the American Desert Southwest. Composing a photograph at times is much like sculpting with light. The photographer removes unnecessary elements to bring out the beauty trapped within the subject. This process is most evident when creating an image from a natural object that can be captured in a way that makes it look a lot like some other creature. Not long ago I visited Devil’s Fire which is where I had the revelation mentioned above. As a photographer, as I “work a subject”, I move around an object, removing extraneous items from my composition until I have an image that satisfies my artist eye. It is not unlike the process a sculptor uses when chipping away at a slab of marble until a work of art is revealed. When I walked around in Devil’s Fire, I was overwhelmed with fascinating rock formations that were all calling to me at once claiming to have artistic compositions trapped within. One in particular was of interest because of its name, The Raptor. I spent an hour, at least, viewing the rock from every imaginable angle, trying to take my photograph from a position that captured the spirit of my vision. I imagined that instead of a raptor, the rock could represent a phoenix rising from a dying fire. The dying fire being the setting sun. I am drawn to naturally occurring inanimate objects that remind me of other living things. I visited the Racetrack in Death Valley recently and saw a rock that reminded me of a frog. A Frog -This rock traveled one hundred yards or so, propelled by natural forces, ending up in the middle of Racetrack Playa in Death Valley. I hiked up the Bristle Cone Trail on Mt. Charleston to see the ancient bristlecone trees. I saw dragons everywhere I looked. Bristlecone Dragon on Mt. Charleston near Las Vegas, Nevada. People see animals in many of the rock formations at Valley of Fire State Park near Las Vegas, Nevada. There are elephants, poodles, crocodiles and many more. Poodle? Valley of Fire State Park near Las Vegas, Nevada. What do you see when you look at strange shapes in the rock or ancient wood? 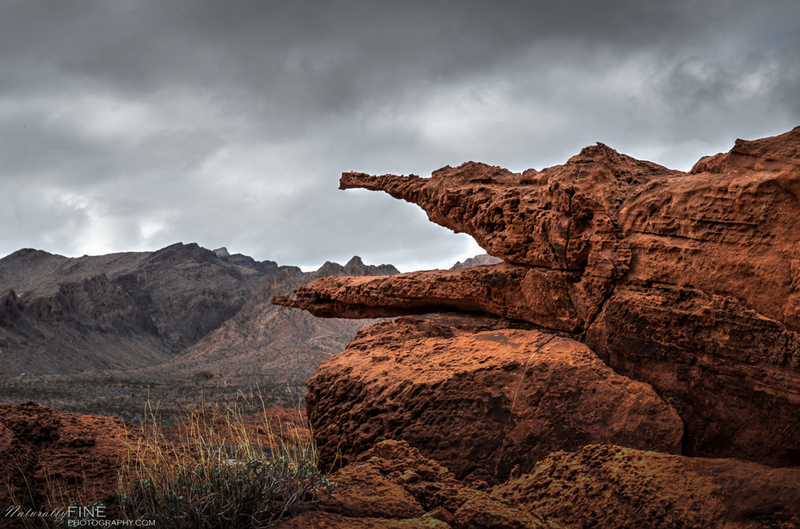 The Elephant at Valley of Fire State Park. I tried to put teeth in the mouth of this crocodile by positioning my camera to get the jagged mountain top in the croc's mouth.